I find that communicating with parents really helps with my classroom management. I know it totally depends on the school and the group of parents you have, but I work at a private school so my parents are consistently very involved. This year, I started sending home a weekly work traits/behavior sheet for my parents. It really motivated my students to have good behavior too! I realized that I needed to be very specific about what behaviors I was seeing in class, and behaviors I wanted to see. These are the main work traits/behaviors that my students needed to work on this year. Parents really appreciate the communication and have a clear idea of how their child is in class. If there is an issue that arises that is not on this sheet, I simply write a note on the back. It takes me less than 10 minutes to complete these for the whole class. 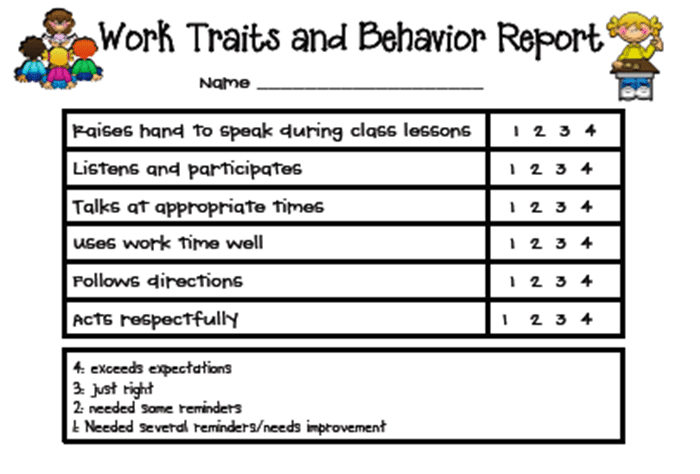 I added the 4 to the sheet because I always have some students who always do the right thing and I wanted to be able to show parents that their child has excellent behavior. I have many students who strive to get 4s every week. They are so proud of themselves when they get those 4s! I also made a daily sheet for my students whose parents need daily communication. I have two students using a daily sheet this year because they are really working on improving their work traits and behavior. I usually add little notes on the back if I need to be more specific. I may even highlight one specific line to show them what I really want them to focus on for the week.